Witnesses for Jesus Christ in Myanmar! 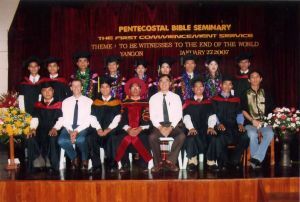 New Partners, John and Rosie Thoung, in Yangon, Myanmar, recently conducted their first Pentecostal Bible Seminary Commencement Service. The zealous class graduated to be "witnesses to the end of the world."